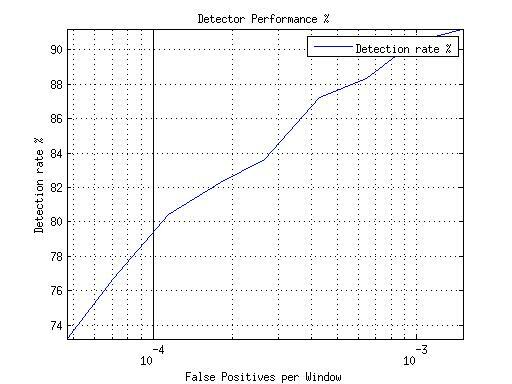 At the reference value of 0.0001 false positives per window my detector correctly labels ~79.5% pedestrian windows. This is around 10 points bellow the original paper, and for this I offer two explanations. Firstly and foremost, I've used a pool of 15000 features for learning and classification, when in the original paper 30000 were used. Secondly, the original paper uses a optimized boosted cascade for decision-making. This type of classification not only speeds up the algorithm by several orders of magnitude, but also leads to a slightly better detection performance, since it is designed to reject most false positives on the first steps of the cascade. Not being able to implement this type of classification myself due to the lack of time available, I resorted to extract less features to speed up the algorithm, thus sacrificing the results. Given these explanations, I think the method is validated and the next step is to test it on our own self-obtained dataset.